Takeshi Sato was born in Miyagi,Japan, He travelled to America in his early adulthood where he taught himself mural painting. He went onto decorating walls of numerous theme parks, restaurants and other kinds of establishments. His innovative style has brought in the essence of craftsmanship into the art world, and his short but vigorous live performance shows have captured the attention of media worldwide. With the experiences and techniques picked up from his days working in commercial art, as well as the edgy speed effects and powerful touches produced with his paint roller, Sato continues to mesmerize audiences everywhere he goes. Since the 3.11 disaster in Tohoku Japan, Sato has devoted much of his time to international fund raising events for various charities. Live painting at "David Bowie is" in Tokyo. 2016.12.16~18 仙台 『 ローラーアートの世界… 2016 in Sendai』チケット発売中!! 2015.7.3.4 大阪 音楽朗読劇 SOUND THEATRE 『CROSS ROAD』に出演。 2015.6.20.21 神奈川 音楽朗読劇 SOUND THEATRE 『CROSS ROAD』に出演。 2015.5.15 渋谷ヒカリエにて『ローラーアートの世界…2015』チケット受付中!! 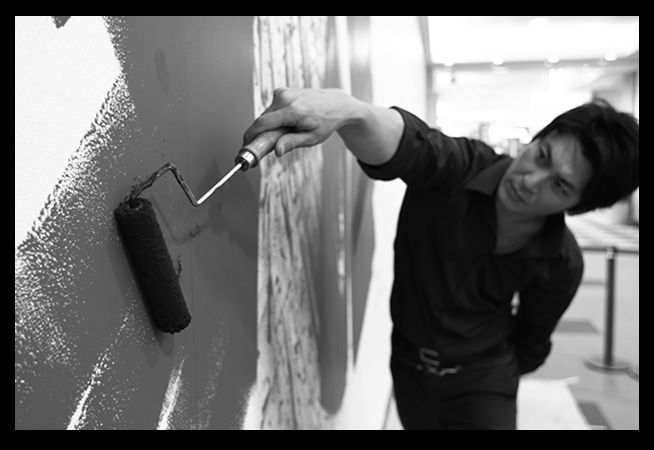 2012.6.2 韓国万博にてライブペイント。LIVE PAINT in Korea Expo 2012. 2012.5.10 ダイワロイネットホテル和歌山にてライブペイント。LIVE PAINT in Daiwa Roynet Hotel Wakayama. 2012.4.30 渋谷ヒカリエにてライブペイント。LIVE PAINT in Hikarie in Shibuya. 2012.3.23~24 香港にて日中国交40周年イベントにてライブペイント。LIVE PAINT in Hong Kong. 2012.3.11 シンガポールチャリティイベント参加。LIVE PAINT in Charity Event at Singapore. 2012.2.23~24 上海にて日中国交40周年イベントにてライブペイント。LIVE PAINT in Shanghai. 2012.2.14 ANAクラウンプラザホテル金沢にてアルファロメオ主催イベント参加。 LIVE PAINT in Kanazawa.